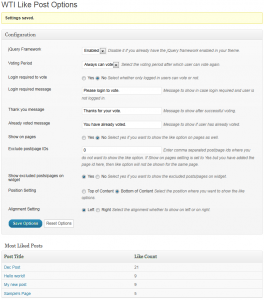 Upload the directory ‘/wti_like_post/’ to the ‘/wp-content/plugins/’ directory. This option is for setting the period after which user can revote. By default, there will be no restriction on user for re-voting that means he can vote against a post as many times as he wants. If you want that user can vote only once that means you want to disable re-voting, then select the option “Once” from the dropdown. If you want user can vote once a day, then select the option “One day” from the dropdown and so on. This option is for setting the different styles of images (thumbs up/down). There are 3 images available. You can choose among those. If you want to have different images, you can replace those images with same name images. This option is to whether restrict the user for voting or not depending upon his login status. If you want user to login before voting, then set it to Yes, else set it to No. If set to No, then guest users can vote. Here you can enter the message that user will see when he tries to vote without logging in where as admin has restricted guest user voting. Default value: Please login to vote. Here you can enter the message that user will see after voting successfully. Default value: Thanks for your vote. Here you can enter the message that user will see when he has already voted for a post. This will also be shown when user tries to vote again with multiple voting from same IP disabled. Default value: You have already voted. 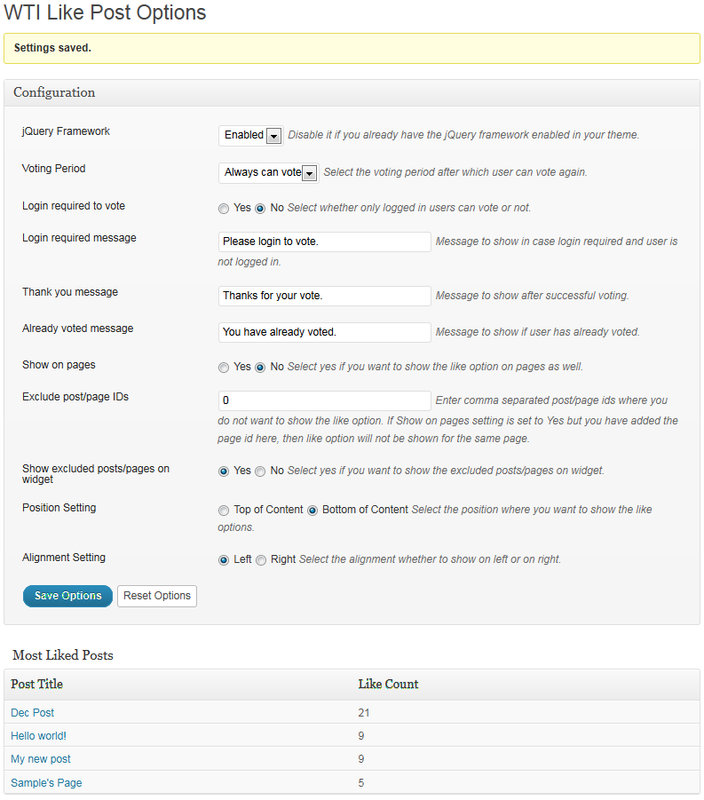 This option is useful if you want to show like option on wordpress pages as well. Set it to yes if you want users to be able to like pages along with posts. Enter comma separated post/page ids where you do not want to show the like option. By default like option will be available on all posts. If you do not want this like option to be available on some specific posts/pages, then enter those post/page ids in this field separated by commas. If “Show on pages” setting is set to “Yes” but you have added the same page id here, then like option will not be shown for the same page. By default, most liked posts/pages will be shown on the “Most Liked Posts” widget. If you have excluded some posts/pages and do not want to show them on the widget, then set it as “No”. Select “Yes” if you want to show the excluded posts/pages on widget. Select the position where you want to show the like options. You have two options here. Either you can show it before the content (Top of Content) or after the content (Bottom of Content). Select the alignment whether to show the like options on left or on right side of the screen.